I’ll start off with the giveaway so you can skip the article if you’d prefer. Leave a comment about your favorite school lunch as a kid, or your child or grandchild’s favorite school lunch for a chance to win “The Laptop Lunch User’s Guide” and a Laptop Lunch Food Thermos. The thermos is too big for one person, but would be great for a picnic for two. Winner will be announced next Friday at the second post for Clara’s Corner. Clara is my 2nd grade daughter and this series is a peek into her lunches, tastes, likes, and dislikes. We try to stay on the healthy side, but treats and some processed food are often part of the meals. Clara’s eating reflects mine of course, and she likes a lot of vegetarian and vegan foods. These lunches are a fun journey and they evolve as her tastes change. Right now she’s at a neat age where she likes adult food, but doesn’t shy away from fun kid food. I don’t expect you to take my ideas and use them directly, as we all have different tastes and notions of what our children should be eating and what they like. What I do hope is this opens up a forum for sharing what works and what doesn’t. Most importantly, I want this to be fun. This series isn’t necessarily about recipes, but more about concepts and ideas. Not everything is homemade, but like most parents I’m slightly discriminating of the processed food I buy. I tend to shop at Costco and my local Co-Op so you’ll probably recognize that. This is a private and honest view into our food life and I hope I won’t be too embarrassed along the way. Please go easy on me! I’ll be posting Clara’s Cold Lunch Corner each Friday for as long as this idea remains relevant. They’ll be patches of missing time over the summer of course, but I still expect to post a shortened version as Clara has summer day camp a couple days a week and will be bringing lunch. Welcome to Clara’s Cold Lunch Corner! I hope you’ll come back and participate. This part is expensive and I've slowly collected these pieces over time. I consider them essential tools for lunches and they cut down package waste. They’re good quality items and should last for years. Never stick thermos and water bottle caps in the dishwasher; they can get water under the seals. Cup-A-Cake Container for cupcakes and frosted muffins. Clara's lunches are a bit large because I pack extra food for her to eat and share with friends on the bus ride home. Week of April 19th-April 23rd 2010. Large uncovered box- 2 Kraft cheese slices, blue cheese dip in small container, carrot sticks in snack bag, cutie orange, 4 chocolate gold coins to share. Small covered box- Two Oberto Beef Pepperoni sticks, sliced. Large covered box- Kid Caesar Salad: Chopped romaine, Parmesan cheese, and garlic croutons. Caesar salad dressing in small dip container tucked inside. Medium covered box- Leftover fried vegetable brown rice with egg. Medium covered box- Cauliflower pieces with small dip container of bleu cheese dressing. Small uncovered box- Snack bag with organic sour gummy cubs. Snack bag with organic raspberry yogurt covered pretzels. Medium covered box- Cauliflower pieces with small covered container of bleu cheese dressing. Sale Alert! I got a nicely timed email yesterday-> Receive 20% off all items at www.laptoplunches.com with coupon code earth2010. Today through Sunday (4/25) only! my grand daughters fave thing is if I do my version of a bento box for her lunch. An 'englishy-fied' version ;o) Have a look at Pikko's bento blog for cool ideas - it doesn't have to be oriental food, but the concept of a 'pretty' box of food seems to go down rather well. My name is Clara as well! So cool! In Germany we don't have school lunches because school ends at lunchtime, but for my breakfast at school I certainly liked slices of a good whole wheat bread with seeds and nuts with some cheese or turkey breast accompanied by an apple! Great idea Laura! My girl is in Year 2 which I think is the equivalent to Second Grade (maybe). I've often thought about sending warm soup in a flask but worry about her tipping it onto herself or if it's not hot enough then the risk of germs. So all our lunches are cold (unless we place a lunch order). Our favourites are rice paper rolls (Vietnamese style) filled with curnchy veges, and pasta salads enriched with bean mixes. There are some cool ideas you've used that I'd like to incorporate into our meals. Thanks! As a kid, my favorite lunch was simple. Bologna sandwich with cheese and mayo, a dill pickle wrapped in plastic wrap so everything wouldn't leak out of my lunch box, an apple, Hi-C fruit juice box to drink, and those chocolate ho ho's for dessert. Such a good lunch, I still buy bologna once in awhile for lunch, otherwise it's much healthier now. Stinks to be an adult sometimes! 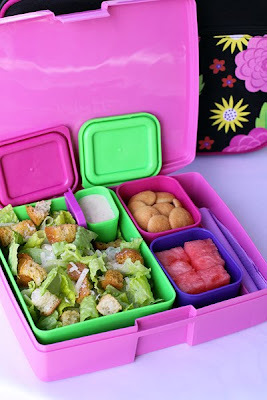 I love that you pack your daughter's lunch in a bento box... looks so appetizing!! What a lucky girl :). I always ate hot lunches in school, but when I was in 1st grade, my mother would walk me home from school for lunch, then walk me back. I don't remember what we ate, but I really looked forward to her coming to get me. I was looking forward to this post :o) Like you I have a second grader but also a 6th grader and a junior in high school, all with different tastes. One thing that they can all agree on are peanut butter and jelly sandwiches (or almond butter) but they also all love artisan bread with butter and cheese on it. That's how I grew up in Germany for my school breaks and they like it just as much! I love the little containers you use, I will have to get some of them as well. This is too funny. I think you know my daughter is allergic to everything so I pack her lunches for school every day and had been looking on Amazon at the laptop lunch boxes but was too cheap to buy one! LOL. I hope I win for her! Lunch for her: Rotisserie chicken, sweet potato hummus, fruit and always gluten/egg/dairy/soy free pretzels. Laura, you have no idea how useful these post will be to me, well more for Cami! I often run out of ideas and I do not even know what else to make for her lunch, since I am not a really good fun of a store bought lunch boxes. I might not be a good cook, but I do get ideas from great cooks like you. Thank you for this wonderful ideas, now I am headed to shop for a laptop box. I probably wouldn't like it now, but I still think about the Chicken Ala King that my elementary school served. As a child, I never really ate normal lunchs. My parents would always have to include rice. My favorite would be bologna and rice. For dessert it was always fruit roll ups. Great post, Laura! And the photograph is beautiful! Looking forward to checking back every Friday. Can't wait to see this series as it develops! I make myself a bento everyday and can't wait until my two girls are old enough that I can make them bentos for lunch everyday too!! I have been packing my son's lunch for 4 years. He's a picky eater and pretty much just gets hot lunch on pizza day. I can't wait to see more of your thoughts on lunches! Clara's lunches sound a lot more healthy and varied! Lucky girl! My mom was a single mom growing up, so I got free daily hot lunch from the school cafeteria. My favorite lunch was their instant mashed potatoes drenched with a turkey-gravy substance, a roll and over-steamed broccoli. Yum! Strangely I still have a taste for it today. Thanks for the op to win the book/thermos - both would come in handy for packing for my dh and for the granddaughter! When I brought a lunch from home it usually wasn't very exciting. I had the normal sandwich, chips and fruit. I really liked some of the school lunches though. My favorite was the burritos. I also really liked the salad but not a lot of kids liked it because it was covered in light Italian dressing and not some heavy and bad for you ranch. Great post!! School lunch, oh my. I'm drawing a complete blank except for the story my dad always told us about his lunch which is unbelieveable-- but I know it is true. They lived in a very small Idaho community where the growing season was short. One of the crops that grew well was onions. He often had an entire onion for lunch. Just an onion. It was his good luck to have a twin brother or he might not have had any friends . . .
One of my 2nd grader's favorite lunches is salad. Usually romaine with a little cheese, shredded carrots, broccoli, and some type of meat. This week it was prosciutto (because it was on sale and is a favorite of mine). She prefers vinaigrette dressing and this week it was strawberry vinaigrette. This was served with kiwi on side and 1 gluten free chocolate chip cookie. She ate every bite! What a great series this is going to be! I don't have biological children, and I live alone, but I still will be looking forward to these posts. For lunch, I had to look forward to whatever was offered at my cafeteria because my mom didn't cook and my dad wasn't around. But, don't cry for me, Argentina (LOL), because I liked the food at school, especially the pizza. Nice! I'm always looking for lunch box ideas, thank you. My favourite food that my mom would pack in our lunches was wagonwheels. Cookies and marshallow covered in chocolate, yum! Every time it was a rainy/cold day I knew my lunch would include my favorite meal. A peanut butter and banana sandwich. I still treat myself occasionally to this little treat and love it just as much. My little Leah is in 2nd grade! I know she would like to sit next to your kid at lunch! I make my kids pack their own lunches in the morning. (it's not my best hour of the day). As a kid I ALWAYS had a PB&J,which would be the first thing in the trash, an apple, pretzles and a little debbie oatmeal cream pie. To this day, I can not eat PB&J, or any fruit/nut flavor combo. But I do still hold a place in my heart for the oatmeal cream pies. My Mom only packed nutritious food, aka "uncool food," in my lunches so I switched to hot lunches as soon as I could to escape the scorn of my peers. I loved the horrendous hoagie sandwiches (with bologna & cheese) and burritos topped with chili and cheese. The only thing that I thought my Mom made better was spaghetti--the cafeteria spaghetti was horrible and I remember the teachers eyeing my spaghetti when I brought Mom's and one commented on how good it looked. I thought she was weird until I tried the lunch room spaghetti. I love this blog post! I pack my son's lunch and it’s leftover from the night before. His class room has a microwave, so he is able to warm his lunch before he heads out to the lunch room. It's so funny the kids in his class always want to know what he's having and if he will share! Now my favorite lunch as a child was when my grandmother Antonia would bring my lunch. It was homemade tortillas with a carne asada, frijoles y arroz with fresh salsa! It was incredible!! Sadly, my favorite lunch was fries with gravy. Not good for you at all. Awesome lunchbox and wonderful ideas! LOVED the blog, thanks! My favorite school lunch was meatball sandwiches. How Lucky Clara is to have a mom that puts so much thought into school lunches!!! Unfortunaly, my mom wasn't the type to pack a lunch or at least nothing I can remember! My favorite school lunch though was the rectangular pizzas that seem to be the go to for all school cafeterias!!! I wish I was your daughter. Your homemade lunchs sound amazing. I make lunches every day for my kids also! My daughter is a vegetarian and my son prefers non-processed foods! It makes me feel better knowing what they eat is balance and nutrious, plus all their friends want bites from their lunches instead of their own :) I always pack a little more dessert to share! My son is in the 2nd grade and refuses to eat school lunches. His all time favorite is grilled salmon, brown rice and veggies. The children would make fun of him for eating vegetables when the school year started. Now some of the children tell him that he is lucky to have his mom bring homemade food everyday. I loved creamcheese and jelly sandwiches as a kid. I found your site because I just bought Laptop bento boxes for my four kids and I! We all watched Jamie Oliver's Food Revolution and began talking about their lunches. I was/am appalled! I googled healthier options and stumbled upon the world of bento boxes! We are excited. The boxes won't be here until Tuesday but we stocked up on pretzels, strawberries, cherry tomatoes, mini bagels, veggies, hummus, pitas and cheeses for next week. I just broke my knee so this will work well for me while I am home too! Pack my lunch and keep it close during the day! Thanks for the site! I am so glad you found me too! I just started this series and am not sure if anyone will be interested. Your comment makes me feel this might be useful in some way. I hope your knee heels well. I've been there it's horrible!! Take care of you.